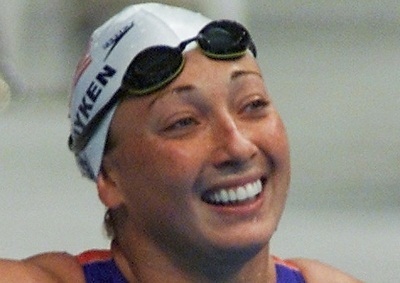 SCOTTSDALE, Arizona - Six times Olympic gold medallist swimmer Amy Van Dyken's (41) spine has been severed in all-terrain vehicle crash. She told an emergency crew on Friday (June 6 2014) she could not move her toes or feel anything touching her legs. The hospital could not provide details but said on Monday (June 9 2014) that the swimmer was "in good condition". Her family said the spine was severed at the T11 vertebra* and that the broken bone came within millimetres of rupturing her aorta". A police report said the ATV hit a kerb in a restaurant car park and fell into a two-metre drop. She was found lying on the ground next to the ATV. She was not wearing a helmet. Van Dyken's husband told police he had changed the throttle mechanism on the ATV from a thumb accelerator to a twist-grip a few days before the accident, though wasn't sure if it was a factor in the accident. He said his wife had not been drinking. Rouen starred at the 1996 Atlanta Olympics where she became the first US woman athlete to win four gold medals at a single games: 50m freestyle, 100m butterfly and with relay teams the 400m freestyle and 400m medley. Four years later, in Sydney, she added two more golds in the 400m free and 400m medley relays then retired from competition. Rouen grew up in Denver, Colorado, and became a world-class swimmer despite suffering from asthma as a child and into adulthood. She's worked in TV and radio since retiring from competitive swimming. * The T11 vertebra is the second lowest of the 12 thoracic vertebrae making up the central part of the spine.